EURUSD has broken the consolidation range upwards to reach the short-term target at 1.1393 and formed the Flag pattern inside it. 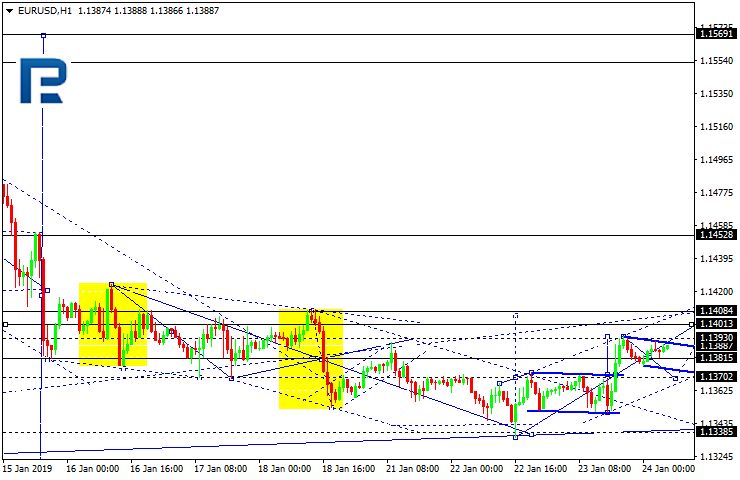 Today, the pair may fall to reach 1.1370 and then grow to return to 1.1408 (an alternative scenario). According to the main scenario, the price is expected to move downwards to break 1.1338 and then continue trading inside the downtrend with the target at 1.1310. 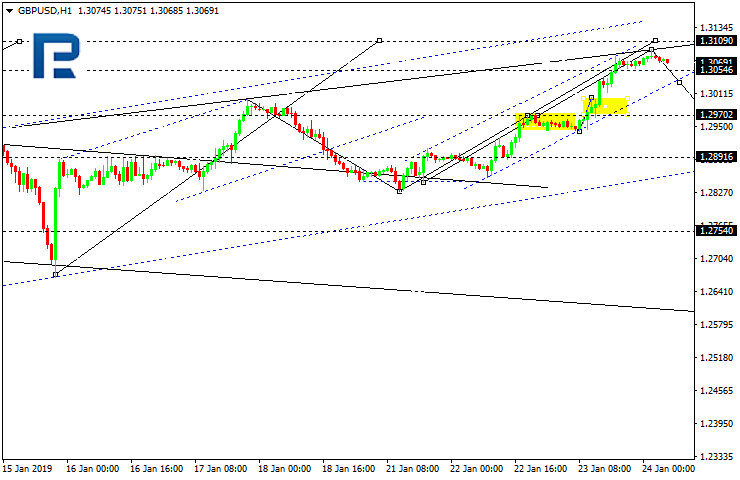 GBPUSD is trading upwards; it may extend the wave up to 1.3109. Possibly, today the pair may start the fourth descending structure to reach 1.2970 and then the fifth ascending one towards 1.3109 to complete this extension. After that, the instrument may form a reversal pattern for a new another descending wave. USDCHF has broken the consolidation range downwards. Possibly, the pair may be corrected to reach 0.9926 and then form one more ascending structure to test 0.9959 from below. Later, the market may fall to return to 0.9926 and then continue trading inside the uptrend with the short-term target at 1.0000. 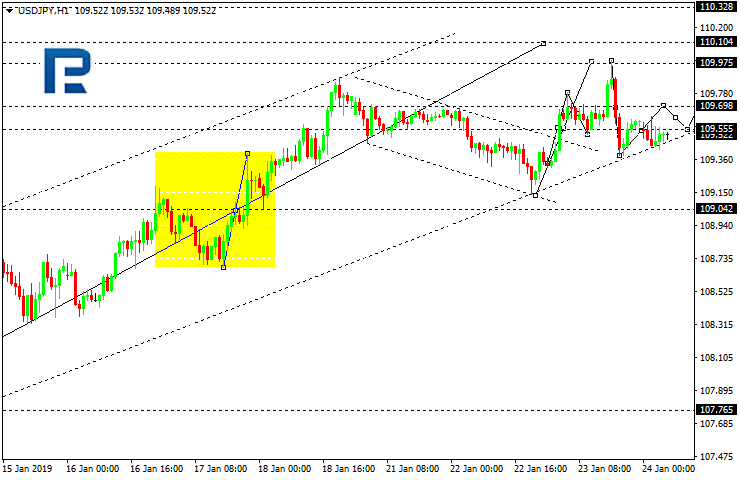 USDJPY has broken 109.55 upwards; it has completed another rising wave at 109.99 and then returned to 109.55. Possibly, today the pair may form a new consolidation range around this level. If the instrument breaks this range to the upside, the price may expand it up to 109.70; if to the downside – fall to reach 109.30 and then form one more ascending structure with the target at 110.10. 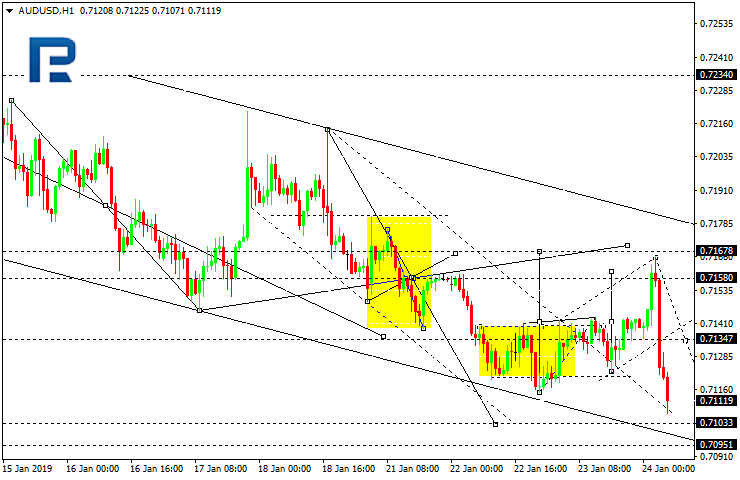 AUDUSD has broken the consolidation range upwards and reached the target at 0.7158. Possibly, the pair may rebound from this level and form a new descending structure towards 0.71035. After that, the instrument may start a new growth with the target at 0.7137. USDRUB is still trading downwards. 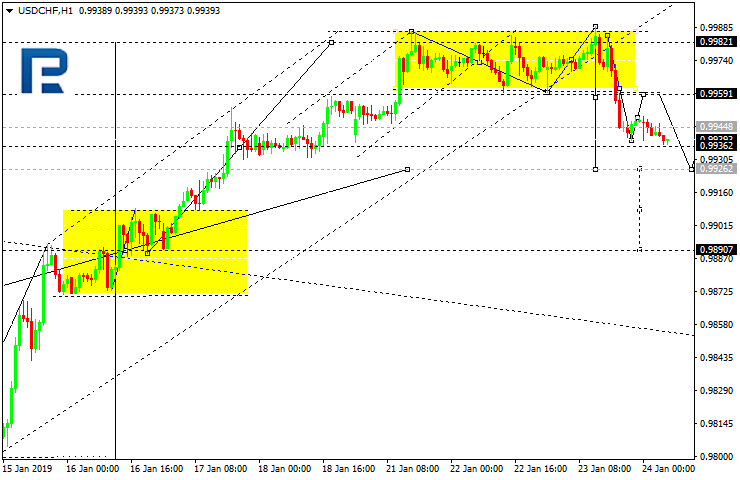 Possibly, the pair may reach 65.92 and then form one more ascending structure with the target at 66.61. Gold has broken the correctional channel downwards. 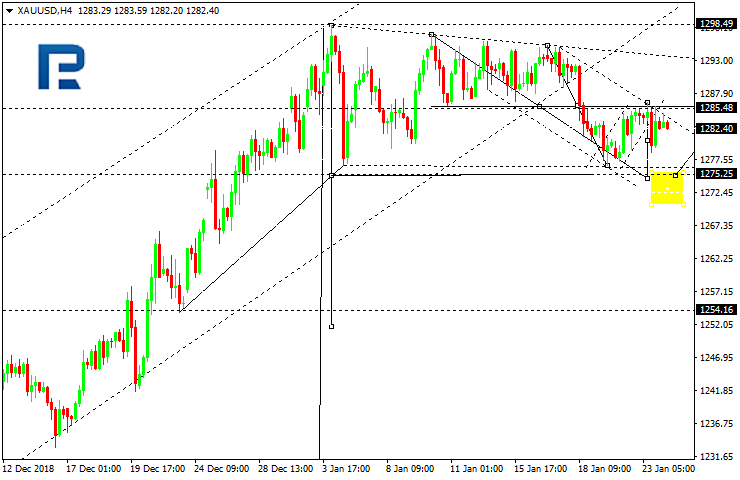 Today, the pair may reach 1275.25 and then start a new growth towards 1285.45. However, if the market breaks 1275.00 downwards, the price may form a downside continuation pattern there. The short-term target is at 1254.16. 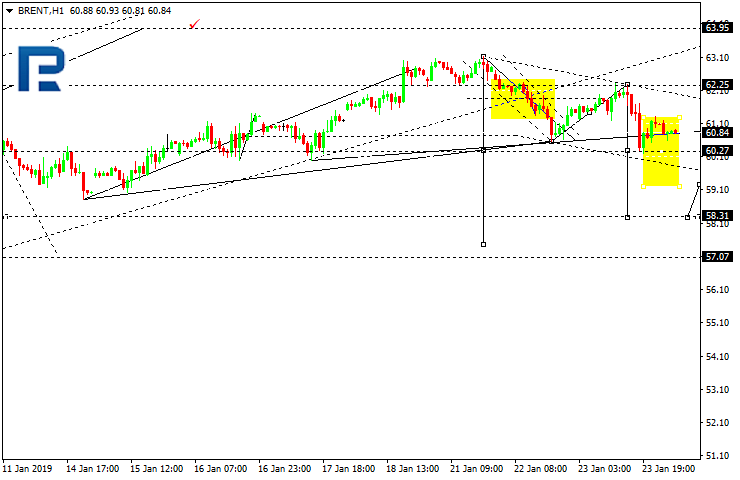 Brent is trading downwards; it has broken the low of the first descending impulse. 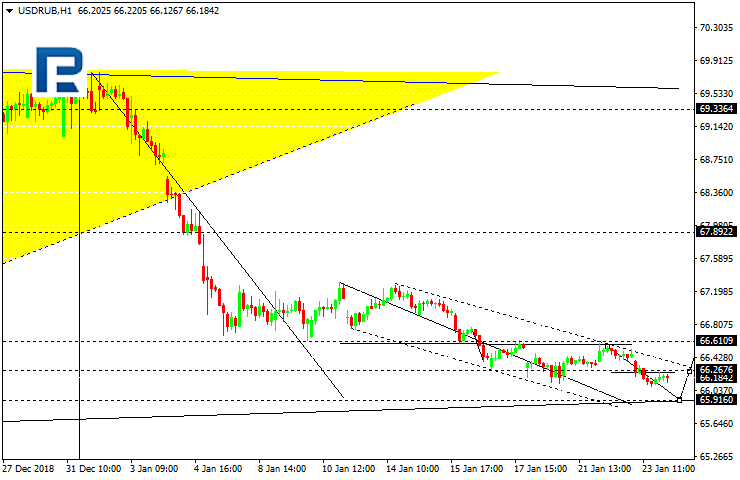 Possibly, the pair may continue the correction with the short-term target at 58.31. After that, the instrument may start a new growth towards 60.27.